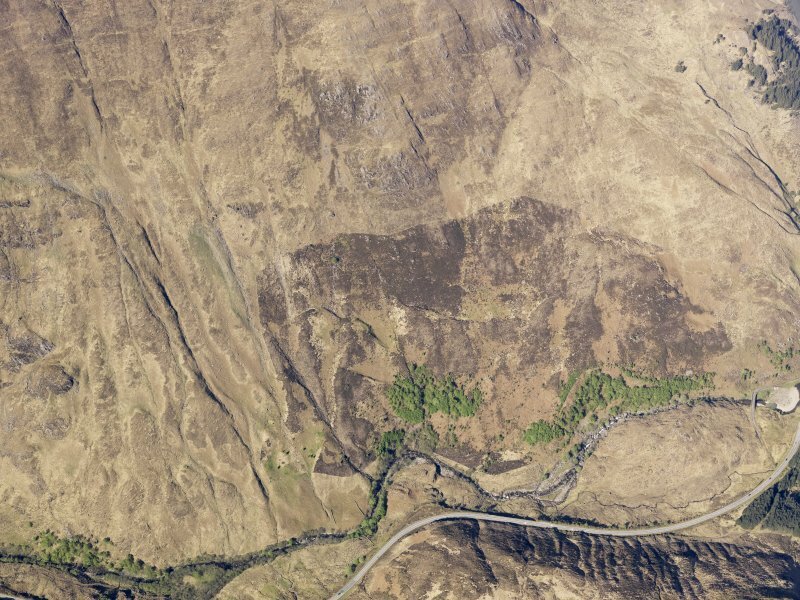 Oblique aerial view of the remains of the breastworks at the site of the Battle of Glen Shiel, taken from the SSW. 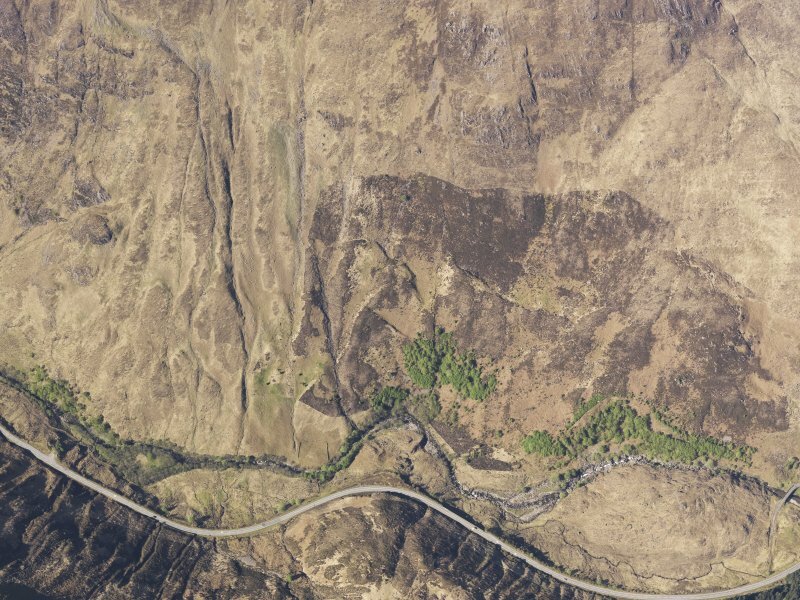 Oblique aerial view of the remains of the breastworks at the site of the Battle of Glen Shiel, taken from the SW. 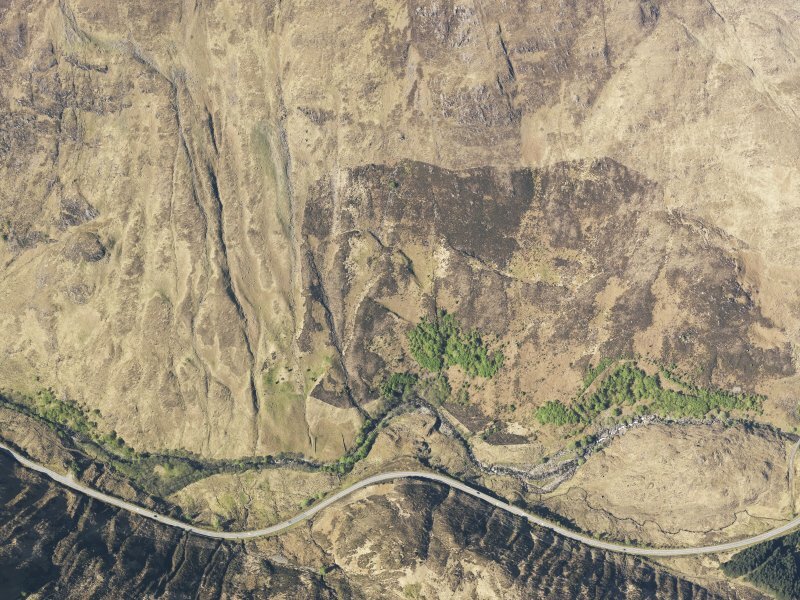 The Battle of Glenshiel was fought on the 10th June 1719 between Highland Jacobites, supported by Spanish troops, under the Marquis of Tullibardine; and Government troops, supported by Dutch and Swiss, under General Wightman. The Jacobites were defeated. Advancing from the west, the Jacobites took up a position at the narrowest part of the gorge, where they threw a barricade across the road and erected stone breastworks on the face of Spanish Hill - named after the Spanish troops who manned them - to the north of the road. Traces of these breastworks still remain. 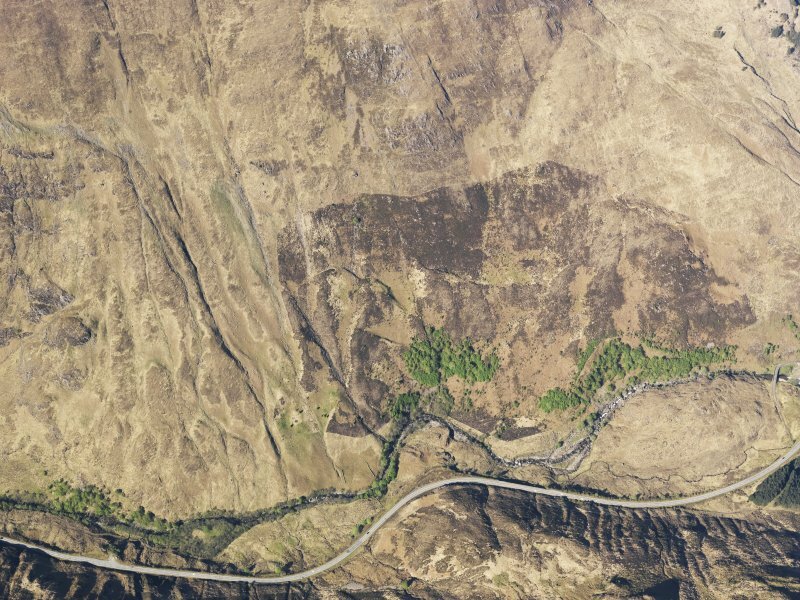 The remainder of the Jacobite army defended the hillock opposite Spanish Hill on the south side of the river. This battle prevented the projected Jacobite uprising. 'Colonel Wightman's Grave', published on the OS Map, is certainly not that of Wightman who long survived the battle. Only three officers - one British and two Dutch - and eighteen men were killed on the Government side, and Jacobite losses were even lighter. The grave of the one British Officer, Captain Downes of Montague's Regiment, is by the river, on the south side and just above the gorge. 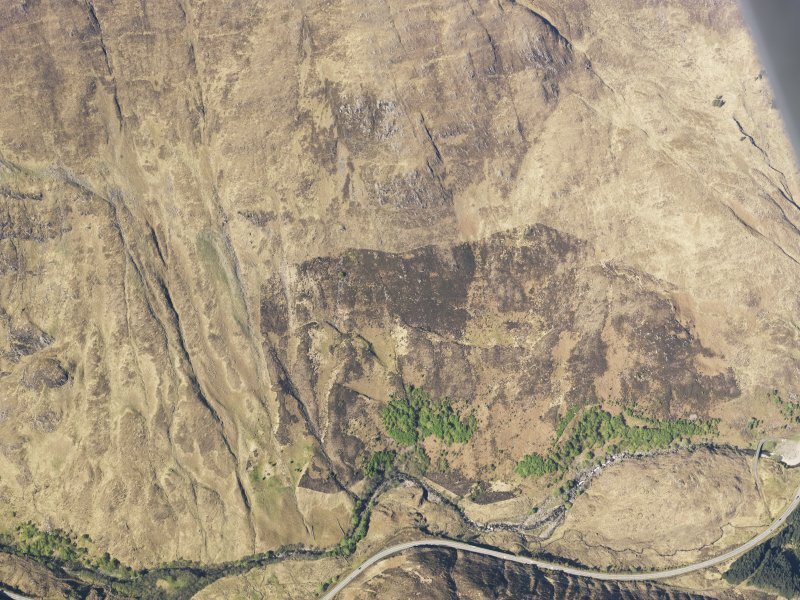 Local tradition maintains two burial places for the Spanish dead - Eilean nan Gall (NG 9320) and by the old church at Clachan Duich (NG92SW 3) which the Jacobites had used as a hospital. Rev. John MacRae (NSA 1845), the sole authority for the OS publication of both the battle site and 'Colonel Wightman's Grave', in his extremely inaccurate account of the battle, says that 'the green mounds which cover the graves of the slain' could be distinguished at the scene of the battle in 1836. New Statistical Account (NSA, Rev J MacRae) 1845; Name Book 1874; W K Dickson 1895; Marchioness of Tullibardine 1908; J J Galbraith 1928; I C Taylor 1965; Information from Murdo McCrea (Formally of Lub an Eorna) and J Ross (Achnagart, Glenshiel). The two stone breastworks on the E face of Spanish Hill at NG 9930 1333 measure 13.0m and 0.8m high. They are crudely constructed and incorporate the natural boulders which abound on the hill. No trace of the graves or the barricade across the road remain. Visited by OS, (N K B) 3 October 1966. In addition to the features relating to the battle, on a terrace in the E-facing hillslope two-thirds of the way up to the top of the knoll, are the stone footings of a round-ended shieling hut aligned NE/SW c6m by c3m over 'walls' c0.4m wide and c0.15m high. Another is c4m by c2m, a third is c3.5m by c2.m, both aligned E/W and a third, aligned NE/SW, is c4m by c 2.5m. It is possible that Bastide has recorded the larger shieling hut on his contemporary record of the battle.